After my last review of a young British child prodigy I go to the other extreme, looking at another British musician, but one who is sixty this year. 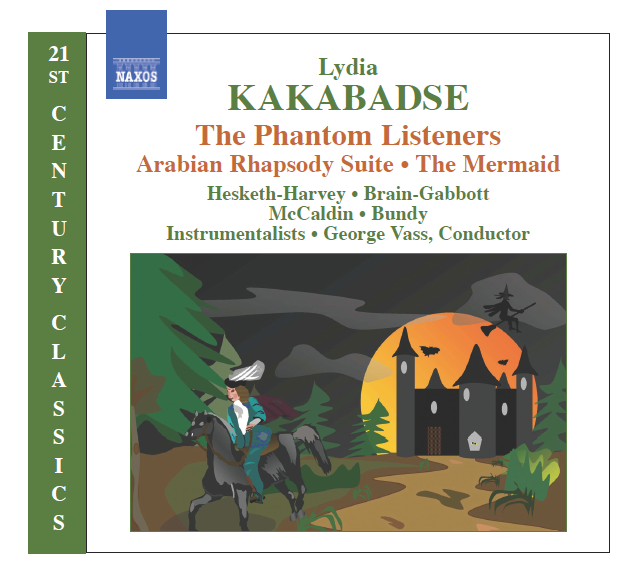 Listening to this CD featuring several of her works, you might be surprised to learn that Lydia Kakabadse was born in Southport and raised in Altrincham, Cheshire. Her music comes across as anything but stereotypically British. It’s easier to understand her influences when you appreciate the influence of her parents – a Russian/Georgian father and a Greek/Austrian mother. From her parents she inherited a love of languages and a passion for the arts. A graduate of Royal Holloway College, University of London, Kakabadse went on to study, teach and perform Greek and Middle Eastern dancing. The result of these influences is this delightful collection. My favourite tracks are the ‘Arabian Rhapsody Suite’ which conjure up a wonderful Arabian fantasy. All the more remarkable considering the composer was undergoing breast cancer treatment at the time of writing. There is no angst in these pieces; there is, instead, adventure and great sensuality – a tribute to her strength and courage. I’m less keen on ‘The Mermaid’ and ‘The Phantom Listeners’ which are musical pieces accompanying a narrated story. This is a case of personal taste for the arrangement is perfectly written. I’m sure these are wonderful to see performed – especially for children, the target audience for ‘The Mermaid’. I prefer music without narration though no matter how magically narrated by Kit Hesketh-Harvey (a narrator impossible to fall asleep to). If you enjoy a good dramatic story however, you’ll enjoy these. All in all, while this music doesn’t break new ground, it is a definite delight and worthy of the critical claim it has received. Even if you’re not a lover of classical music yourself its perfect as a gift for anyone known to you who is. It certainly transported me back to my youth, growing up with Russian folk tales and the exploits of Sinbad the Sailor and for that I’m grateful. A lovely gem! You can buy her CD on Amazon (UK) or Naxos.